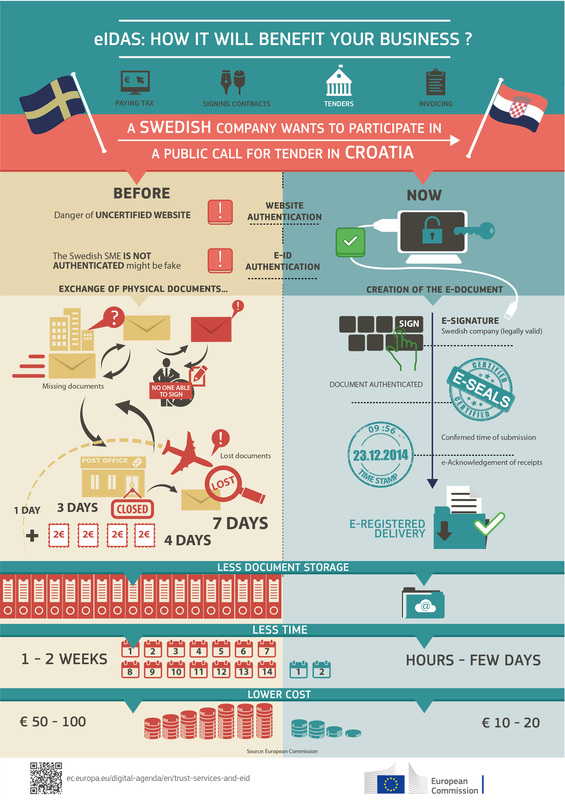 eIDAS stands for electronic Identification (eID), Authentication and Trust Services. The eIDAS Regulation established the framework to ensure that electronic interactions between businesses are safer, faster and more efficient, no matter the European country they take place in. eIDAS is a European Regulation that creates one single framework for eID and trust services, making it more straightforward to deliver services across the European Union. It promotes interoperability across the 28 EU Member States ensuring that countries mutually recognise each other’s notified electronic identification schemes across borders. It also ensures that the trust services provided by service providers who comply with the requirements in the Regulation (e.g. qualified service providers) can be accepted as evidence in legal proceedings. Electronic Identification (eID) allows businesses and consumers to prove electronically that they are who they say they are and gain access to services or carry out business transactions online. eID can be used in both business-to-business and business-to-consumer transactions. eID provides business with the opportunity to carry out stronger checks on the identity of customers and other businesses. This is of particular use when trading restricted goods (e.g. alcohol) or in high value transactions (e.g. the sale of artwork, transfers of large amounts of money). It also allows businesses to expand their customer base, providing a trusted identification of customers and businesses in other EU countries. The use of national eID systems in cross-border business transactions between EU countries depends on the stage of notification by each individual EU Member State. Notification refers to the process of selecting, reviewing and adding a national eID system to the network of eID schemes that have to be recognised by other countries. Notification ensures that all notified national eID schemes meet the quality and security requirements established in the eIDAS Regulation. Under the eIDAS Regulation, all EU countries will have to recognise foreign eID schemes that have been notified to the European Commission and many are already in the process of implementing their solutions. Member States may also notify their national eID systems but may choose not to open these systems to the private sector, although they are encouraged to do so. Find out if an eID system has been notified in your country. Whilst the focus of this page is on business-to-business / business-to-consumer transactions, there are also a number of interesting use-cases in a business-to-government context. These are electronic services that make electronic business transactions more secure. There are different trust services under the eIDAS Regulation that serve different purposes. Electronic signature (eSignature): is the expression in an electronic format of a person’s agreement to the content of a document or set of data. Qualified eSignatures have the same legal effect as hand written signatures. Electronic seal (eSeal): is similar in its function to the traditional business stamp. It can be applied to an electronic document to guarantee the origin and integrity of a document. Electronic Timestamp (eTimestamp): links an electronic document, such as a purchase order, to a particular time, providing evidence that the document existed at that time. Website Authentication Certificates (WACs): are electronic certificates that prove to your customers that your website is trustworthy and reliable. They ensure that the website is linked to the person to whom the certificate is issued. They also help avoid data phishing. Electronic Registered Delivery Service (eDelivery): allows the user to send data electronically. It provides proof of sending and delivery of the document and protects your company against the risk of loss, theft, damage or unauthorised alterations. The private sector has already begun exploiting these in various different sectors, such as the use of eSignatures in the professional services and financial services sectors. Better user experience: ensuring smooth service and product delivery. Gaining the trust of customers is essential for any business and contributes to increasing customer satisfaction by focusing efforts on establishing a relationship with them. Increased security and liability: the eIDAS Regulation ensures greater assurance between parties thanks to secure solutions and legal certainty. Greater efficiency gains: through reduced process cycles, large scale automation, simplified and faster task execution and overall cost reduction whilst maintaining the quality of products, services and support. A downloadable guidebook is available to help businesses to understand and incorporate eID and trust service solutions into their daily business operations. It is designed as a quick-reference guide on key information on eID and trust service solutions and the opportunities they can provide to European businesses. A downloadable checklist is available to help businesses to choose the appropriate eID and trust service solutions for their business. It will help the user to understand the key criteria that need to be taken into account when evaluating eID and trust service solutions, according to their business needs through a series of questions/checks. This checklist is aimed at those businesses that are looking to incorporate eID and trust services into their business. The eIDAS observatory is a virtual community of stakeholders that discusses issues related to the uptake of eIDAS solutions to help promote the use of cross-border electronic identification and trust services in Europe. The Observatory is open to everyone – businesses, individuals and public administrations, and representatives from various different sectors, to promote knowledge sharing and to develop initiatives for innovation. Use cases will show you how the eID and trust service solutions can be incorporated into your day-to-day business activities. Test eIDAS solutions in a simulated environment through our interactive tool using real life use cases. The interactive tool also provides examples of the applications of eIDAS solutions in different sectors.